Slow Burn Theater Company opened its co-production of The 25th Annual Putnam County Spelling Bee at the Broward Center for the Performing Arts on February 26, 2015. H-I-L-A-R-I-O-U-S! Infectious songs and an L-O-L script make Putnam County Spelling Bee a winner. With two Tony Awards and three Drama Desk Awards, this riotous Broadway smash, complete with audience participation, leads to letter-perfect entertainment. As you follow the cast of six awkward adolescents through a daunting and delightful championship quest, you'll know why the New York Times calls it, "Irresistible! Riotously funny!" Slow Burn Theatre Company gives this perennial favorite as excellent a production as we’ve seen of it, hitting the perfect balance between the hilarious and poignant, marked with a child’s exuberance for living and an adult’s compassion for the angst over the process of losing innocence. Slow Burn’s production is so light-hearted and entertaining that few people other than theater professionals will appreciate just how smoothly and skillfully this has been put together and executed. But Fitzwater and friends have invested a lot of seamless and invisible craft in every aspect, down to Sean McClelland’s gymnasium in primary colors, to Lance Blank’s ever-morphing lighting, to Danny Butler’s crystalline sound (now that he has a good system to work with), to Rick Peña’s costumes that copy the originals, but are dead perfect. Musical director Manny Schvartzman didn’t have a live orchestra for a change, but his tracks were flawless. Every single actor displayed strong, expressive voices and invested their being into making these cartoonish characters as endearing and plausible as possible. To unfairly single out a few: O’Neill’s gorgeous soprano, which seems to soar ever higher and clearer each year, is infused with the emotion of a character living on her single past glory. Slow Burn newbie but regional veteran Della Ventura was a perfect blend of insecurity masked by obnoxious confidence. And once again, the winsome Chamberlain is outstanding as the gentle Olive, especially in a heart-rending lovely trio with O’Neill and Rowley reimagined by Olive in a fantasy as the parents she wished she had. The Abdo space with its cabaret style seating and table service has proved a problematic space for some companies – especially with a stage that seems broad and yet shallow. But Slow Burn appears to have conquered whatever the challenges are. No matter how you spell it, Slow Burn Theatre has a W-I-N-N-E-R with its latest production, “The 25th Annual Putnam County Spelling Bee,” which opened last weekend at the Broward Center. The production is accentuated by Sean McClellend’s colorful school gymnasium set and Lance Black’s lighting design helps differentiate between live and imagined action. Rick Peña, doing double duty as costume designer, effectively sticks to the looks created for the Broadway production. “Spelling Bee” is normally staged as a 90 minute, one act show, but Slow Burn takes a “snack break” to accommodate the Broward Center’s a la carte small plate and bar service. The menu includes a delicious mix from chicken and waffles and shrimp and cheese grits to more traditional sliders and savory popovers, most priced between $7.95 and $11.95. Desserts include a decadent chocolate brownie with vanilla ice cream and New York cheesecake. 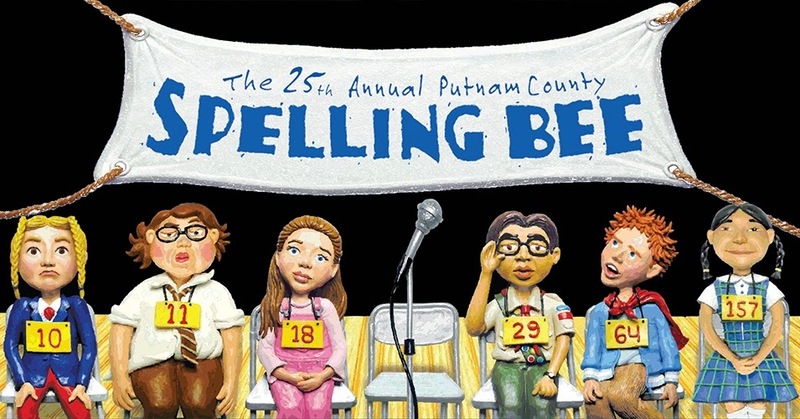 The Slow Burn Theatre Company production of The 25th Annual Putnam County Spelling Bee plays at the Broward Center for the Performing Arts through April 19, 2015.